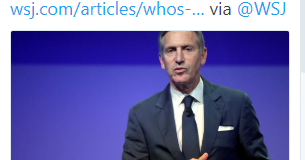 Howard Schultz, former CEO of Starbucks, wants to be president. This is a horrible idea in so many ways, that people ought to be making it abundantly clear to him that he is not wanted. Yet, as Jim Wright explains in the linked article over at Stonekettle Station, that's not what usually happens. USAians really need to get over this wealthy person worship.